I’m a big fan of Trader Joe’s raw nut-and-raisin mix called “Go Raw Trek Mix,” so I was kind of excited about the discovery of a Trader Joe’s “Go Rah” bar in the cabinet this morning: Same-ish sounding name, same blue color packaging, could this be the bar form of my favorite nut mix? Answer: Nope. Not entirely sure what the correlation between the two product lines (or if there even is one), but the Go Rah bar is a pretty straightforward granola-nut bar … That, according to TraderJoesFan.com, was discontinued early April. Odd to discover I’ve been blogging about a food postmortem. I spent the morning at a site in the city that had absolutely zero connectivity — and I was in the middle of Times Square. So bizarre how cell phone dead zones work. Breakfast was but an Apple Pie Lara Bar; if you’re interested, you can find more on my Lara Bar adventures here. I did it! I successfully moved, I ate, I am blogging, I have pretty damn near conquered. Pictured: melty pepper jack cheese over genoa salami on top of a thick slice of white onion, which is on top of a hearty, nut-grain bread that’s been slathered in a spicy brown mustard. In the background, flax seed tortilla chips from Whole Foods, which aren’t as good as the ones from Trader Joe’s, if you were wondering. Let’s call it as it is: The middle-of-moving dash into the corner store for refreshments and … apparently, chocolate-covered coconut candy bars. Of the British persuasion. Hmm, that wouldn’t have anything to do with my recent trip to London, would it? No nostalgia/evocation of fond memories/ are involved at all in that purchasing decision at all. I threw in a chocolate chip Cliff Bar at the end for good measure, which didn’t make it into the shot. And no, this isn’t all for me. Cherrio. Breakfast: Hojicha Schmocha, Light Caffine? 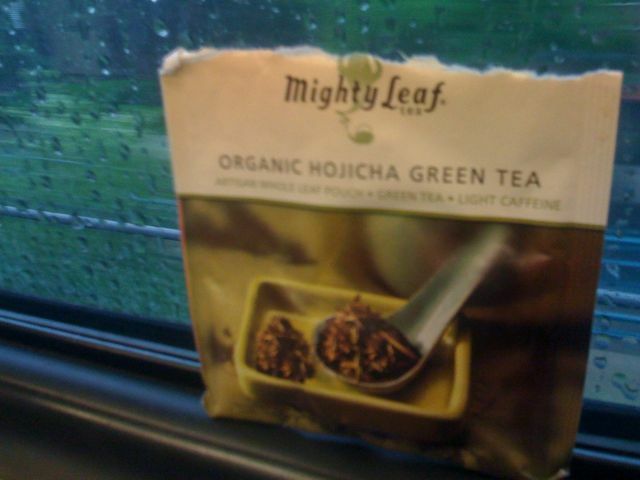 I’ve just made the unfortunate discovery that this Mighty Leaf organic Hojicha green tea, which I’ve been looking forward to trying with some anticipation, is “light caffine.” Is it even possible to have “light caffine” and “green tea” in the same sentence? If we’re comparing tea to espresso… sure. But in the tea world, green tea generally packs a pretty good punch. On occassion, like mornings I’m out the door to catch an early train on the Long Island Rail Road, I’ll even say I look forward to it. My issue lies in the fact that because “light caffine” I’d so explicitly stated on the packaging, is that advertising that they’ve dumbed this tea down? Therein lies the travesty. This “pan-fired and slow-roasted” Hojicha business has a lot of work to do. “Rich and nutty brew,” bring it.